In the latest instalment of our 'Artist Spotlight' series ACS artist Nina Mae Fowler explores the relationship between drawing and sculpture, ​using cultural icons as ciphers to investigate the dark underbelly of fame. I primarily work with pencil on paper. I find it the easiest way to express what I want to. I love drawing. It is an absolute pleasure for me. I tend to give my drawings a sculptural element by cutting them or applying objects to the surface. I like to push the drawings beyond the flatness of 2-dimensions and try to find ways of breathing new life into them. I try to find contemporary ways of exploring the relationship between drawing and sculpture whilst still using fairly traditional techniques. The way I research my work has changed dramatically since the dawn of the Internet. I used to visit specialist shops or seek out particular archives. I remember doing my Art A-level and sitting for hours in a booth at the British Museum watching Andy Warhol films which would be readily available at the touch of a button online now. I still watch a lot of films, cutting and pasting film stills together to make compositions for drawings. I also find inspiration in the work of other artists, especially photographers; Robert Mapplethorpe, George Platt Lynnes, Edmund Teske to name a few. I find great inspiration in literature too, for example, I recently read ‘Blonde’ by Joyce Carol Oates, a fascinating work chronicling the inner thoughts of Marilyn Monroe, which although it reads as a biography is in fact a work of fiction. I found many links with my own work in this extraordinary book. My process is very much about the collection of ideas and images brewing away in my memory bank and coming together bit by bit – sometimes with great immediacy but more often, over long periods of time and with much consideration. I recently completed two drawings entitled Modern Silver: Parts I & II for a group exhibition in Berlin. The idea had been floating around in my subconscious since I saw a 1920’s advertisement for a brand of glasses in a local antique shop – it read “Nothing Better For Your Eyes”. I found this phrase very romantic and begun thinking about images I could draw around the idea. I have always collected hair and make-up test shots (when an actor is photographed for the purpose of testing their ‘look’ for a particular scene). These images are fascinating to me as the actors are being themselves – just props for hair and make-up designs. They are often holding a card showing their name, character and a description of the scene e.g. ‘drunk and disheveled’. So I decided to make two drawings – male and female – of Humphrey Bogart and Vivien Leigh. I then placed my own sunglasses onto the drawings. It gives the works a sculptural element and also makes the viewer question whether the blood on Bogart’s’ face, or the tears rolling down Vivien’s cheeks, are actually real. 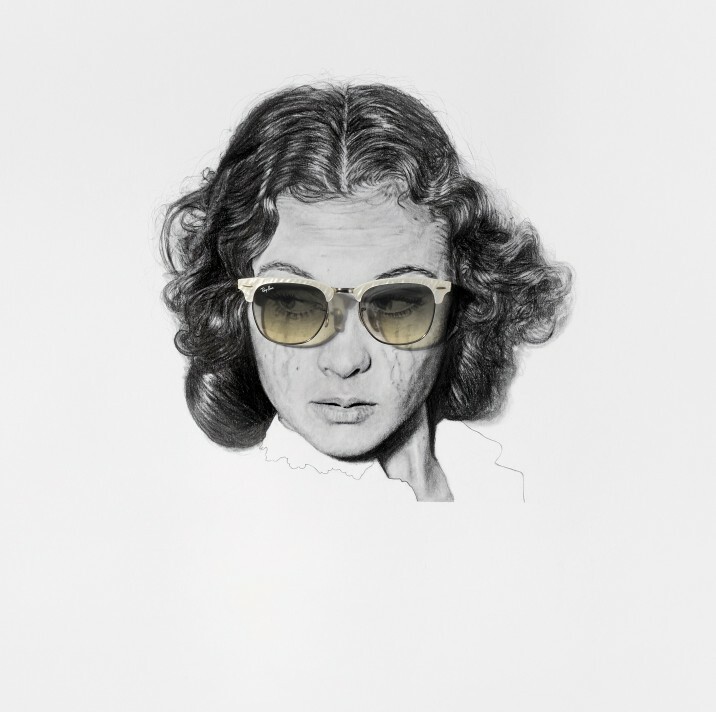 Are the glasses hiding something or simply acting as symbols of self-importance? Or has the artist lent them to the drawings in an act of love and protection. The great Richard Hamilton, and his use of materials – often applying metal to the surface of his paintings and toying with notions of fame and iconography, also influenced these works. A friend at university once said to me “Never question why someone is wearing sunglasses”…. A simple lesson in life perhaps imbued with a deeper meaning than on first reflection. I made many works of art throughout my childhood but I think the first time I realised the potential of something I had created could have, was my final GCSE exam piece. We were given the title ‘Food and Drink’ which I found completely uninspiring. After racking my brain on where I could take it, I ended up depicting Elvis feeding himself, by collaging together images and turning it into a drawing. I would compare it to the first time I held my son and realised how important he was going to be in our life; My eyes were opened to the potential impact of making art, taking my viewers beyond reality and trying to give them unexpected thoughts and new sensations. ‘Elvis feeding Elvis’ still hangs proudly on my dad’s wall.